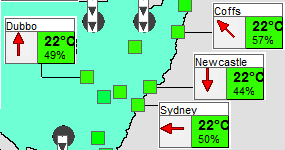 Real-time temperatures for a selection of cities are shown as squares on the map. The squares are colour-coded to indicate the current temperature in the city. Wind speed and direction are denoted by a red arrow. The longer the arrow, the faster the wind. Weather boxes can be moved to any location on the map by clicking on the weather box and dragging to the desired location.